fairly similar average powers per unit area, in the ballpark of 15 W/m2. be 150 GW. This is not the same as current world power consumption. It’s not even near current world electricity consumption, which is 2000 GW. area required would be two 1000 km by 1000 km squares in the desert. one Germany, to 1.4 United Kingdoms, or to 16 Waleses. have the same area as Germany. Figure 25.3. Stirling dish engine. These beautiful concentrators deliver a power per unit land area of 14 W/m2. Photo courtesy of Stirling Energy Systems. Figure 25.4. Andasol – a “100MW” solar power station under construction in Spain. Excess thermal energy produced during the day will be stored in liquid salt tanks for up to seven hours, allowing a continuous and stable supply of electric power to the grid. The power station is predicted to produce 350 GWh per year (40 MW). The parabolic troughs occupy 400 hectares, so the power per unit land area will be 10 W/m2. Upper photo: ABB. 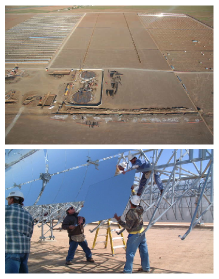 Lower photo: IEA SolarPACES.